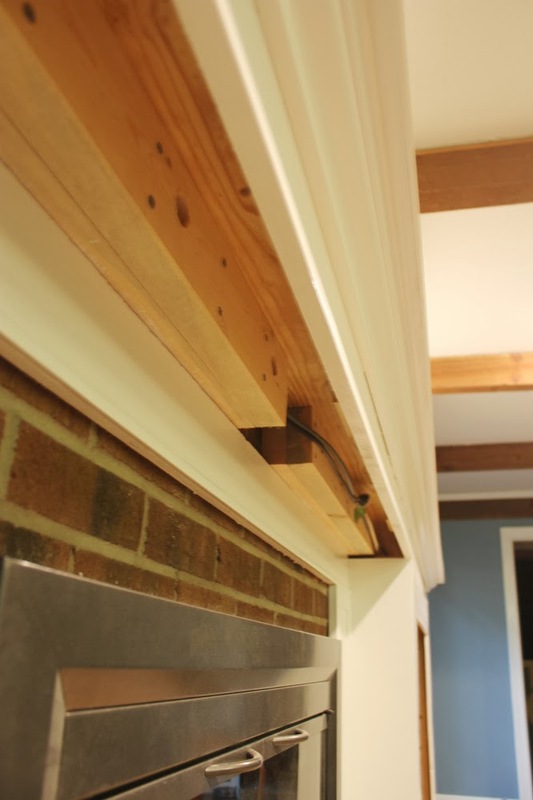 And here is the underside of the mantel in place. 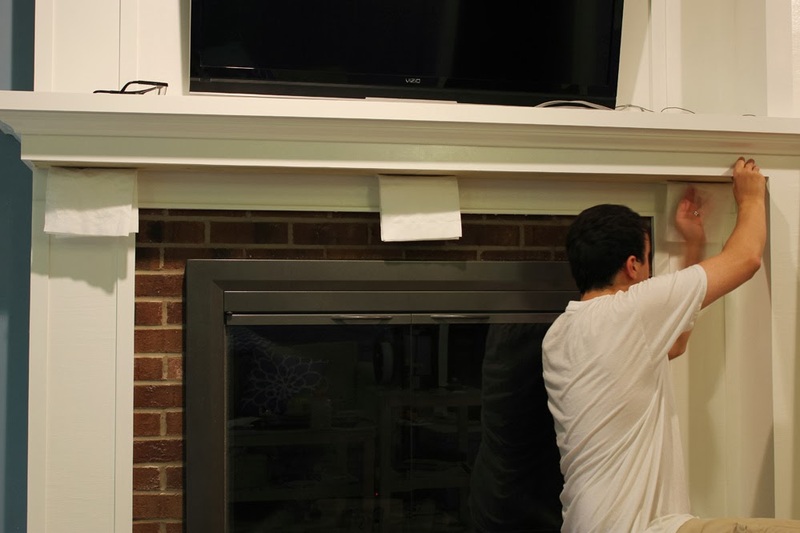 It just wrapped around the sides of the fireplace, and we screwed through the blocks in the picture above to attach it. 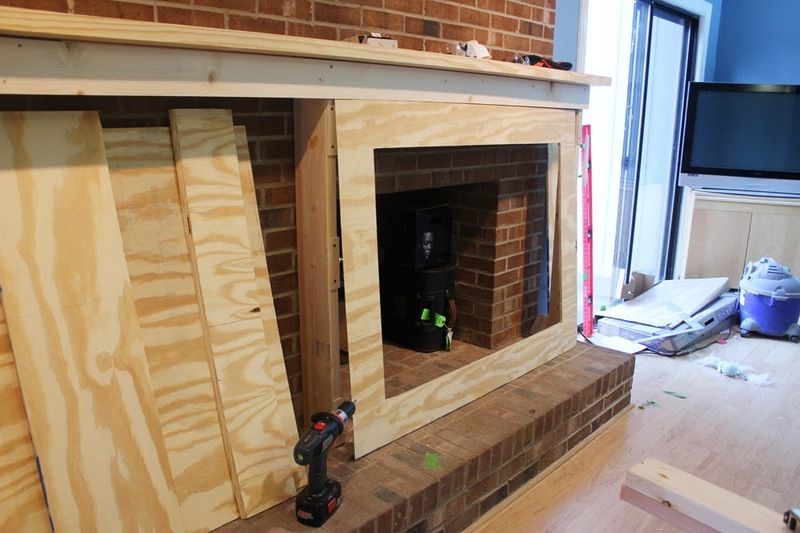 Around this time we also started getting the frame in place for the cabinet on the right side of the fireplace, which you can see the beginnings of in the photo below. 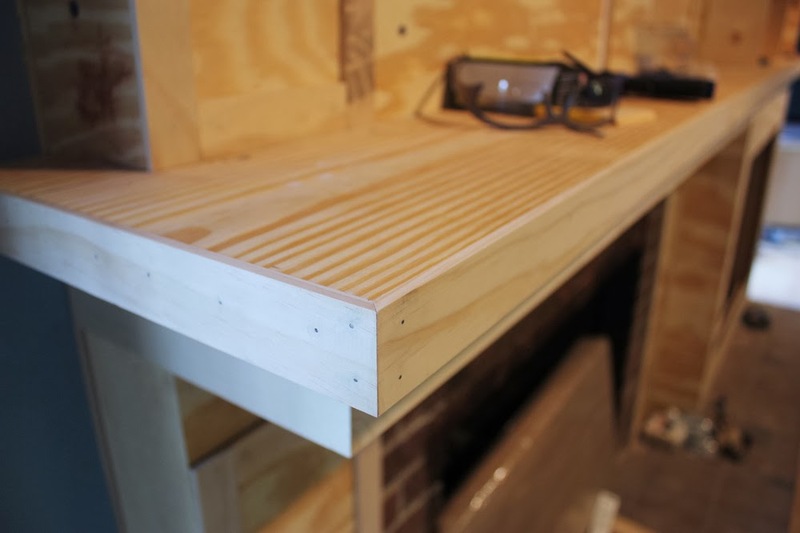 ...And then they will curve down into the empty space between the double ledger board and the underside of the mantel, and into the cabinet, where our DVR is stored. 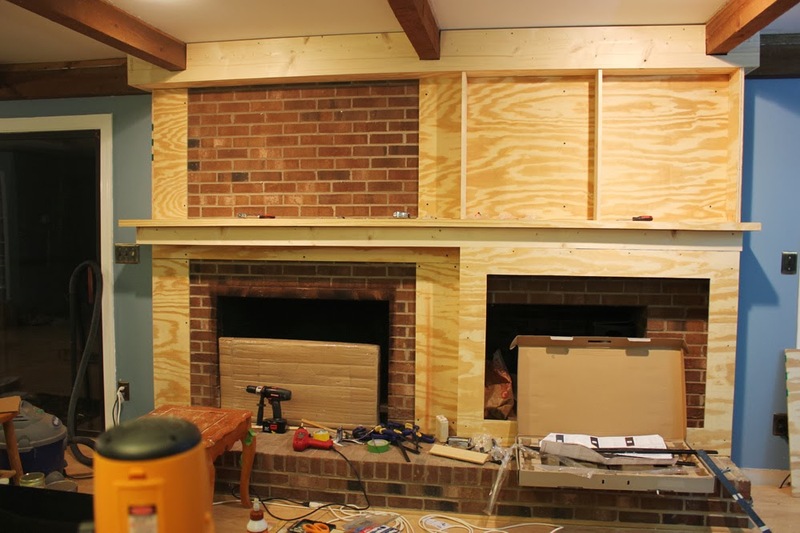 Once we got the important framing and mantel up, and switched to installing the paint-grade plywood, things started going a lot quicker. 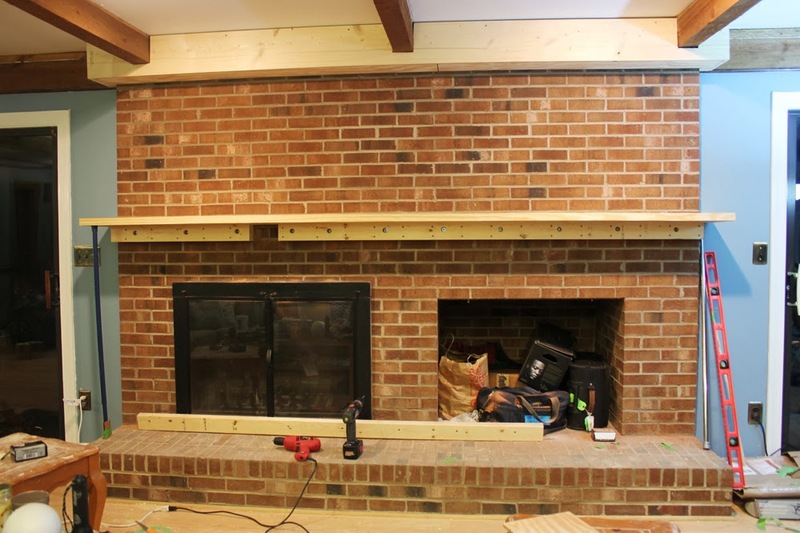 We didn't have to worry quite so much about drilling into the brick with large bolts and figuring out how to attach a very heavy mantel to a vertical surface. 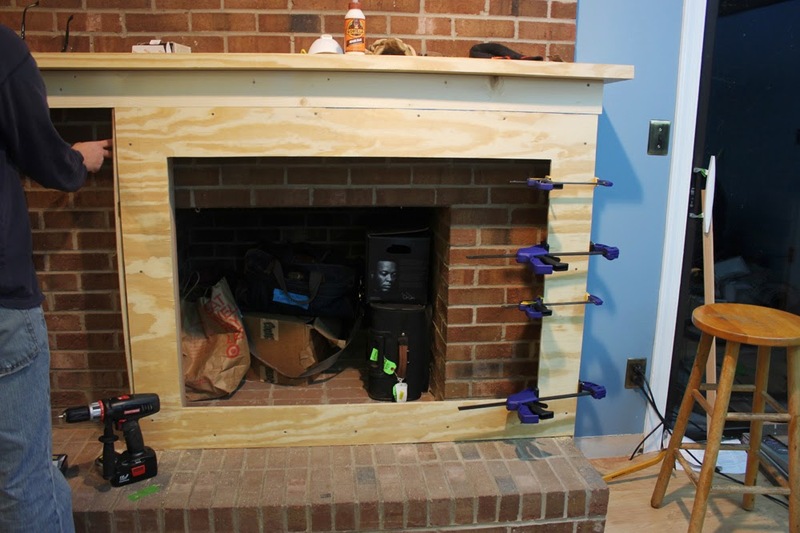 Now we could just concentrate on making straight miter cuts on our table saw and the fireplace facade starting to take shape. The front of the cabinet ready to be attached to the frame. 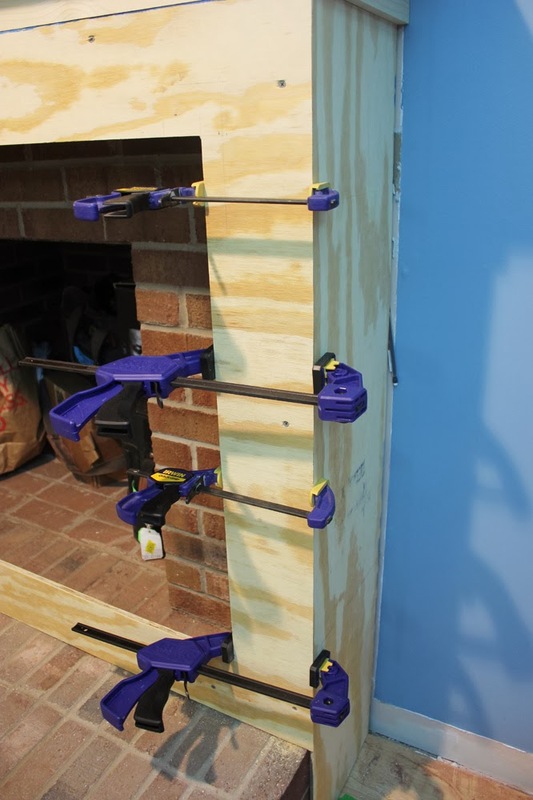 And the gluing and screwing of the sides of the cabinet, with clamps to hold everything in place while the wood glue dried. 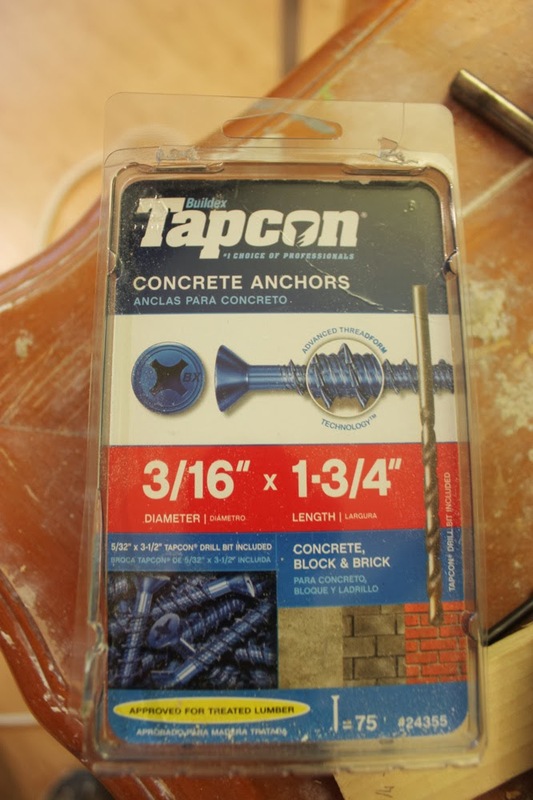 On the sides of the cabinet, and for all the rest of the plywood that would install directly onto the brick, we used these Tapcon concrete anchors, into the brick mortar. 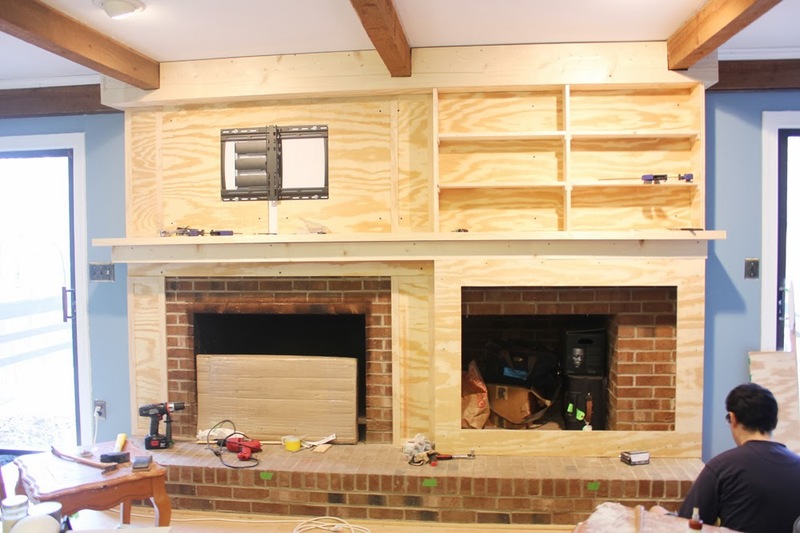 When researching doing this project, I saw quite a few bloggers opt to just use construction adhesive to attach their paneling straight on the brick, however, we wanted to be mindful of doing our install so it would be reversible if we ever wanted to take it down. Patching a few holes in the mortar sounded a lot easier than trying to get glue off of brick! More of the plywood getting installed. 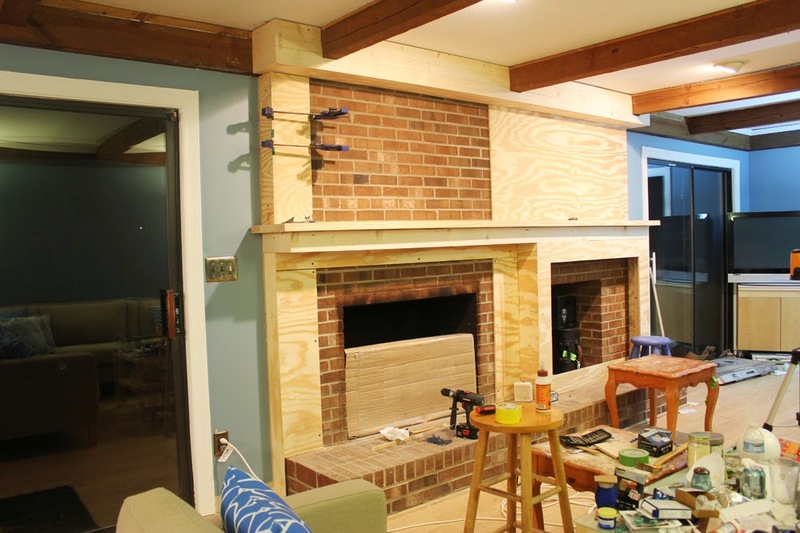 And we took off the old, rusted glass fireplace doors, since we were replacing them. 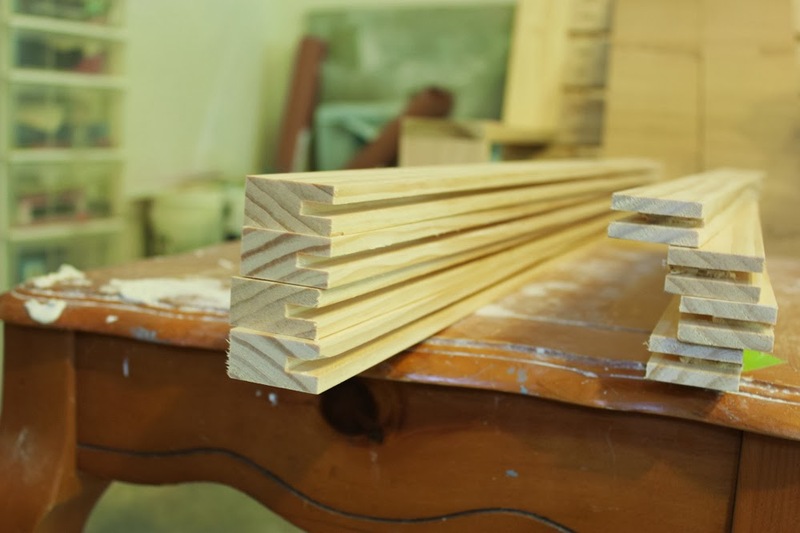 I should also note another thing I saw when researching, some people used MDF instead of paint-grade plywood. Either will give you a relatively smooth finish to paint, but we were nervous to use MDF because of how much it swells when it gets wet. My husband is sure someone is going to knock over a glass on the mantel someday, so that was our reasoning for going with plywood over MDF. Hopefully it will never be an issue though, and the multiple layers of paint will protect everything from potential spills! 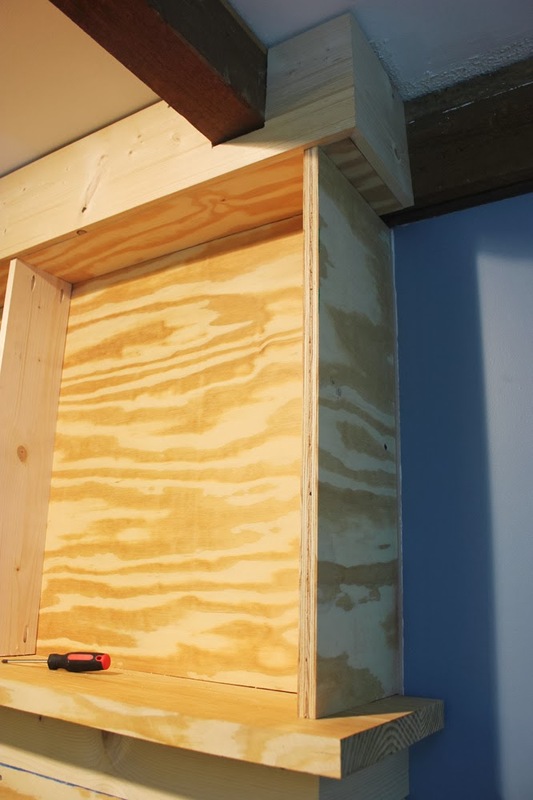 Working on installing the plywood on top. 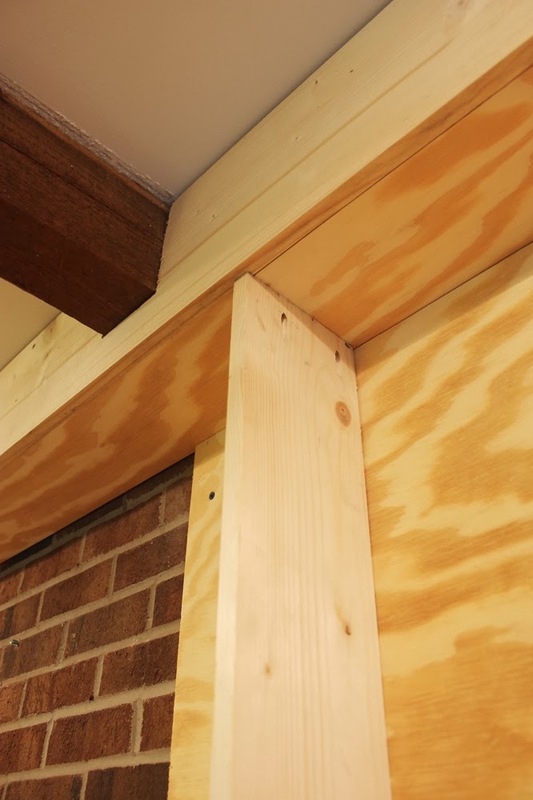 We were careful to make sure the panels of plywood were installed in a way that our trim would hide the seams. 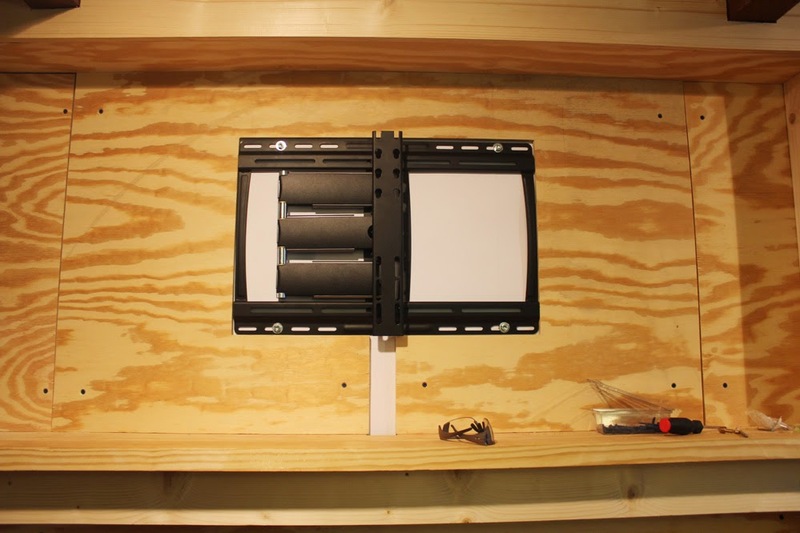 And we made sure the part where our TV mounted (bare in the below photo) would be separate from the rest of the paneling. 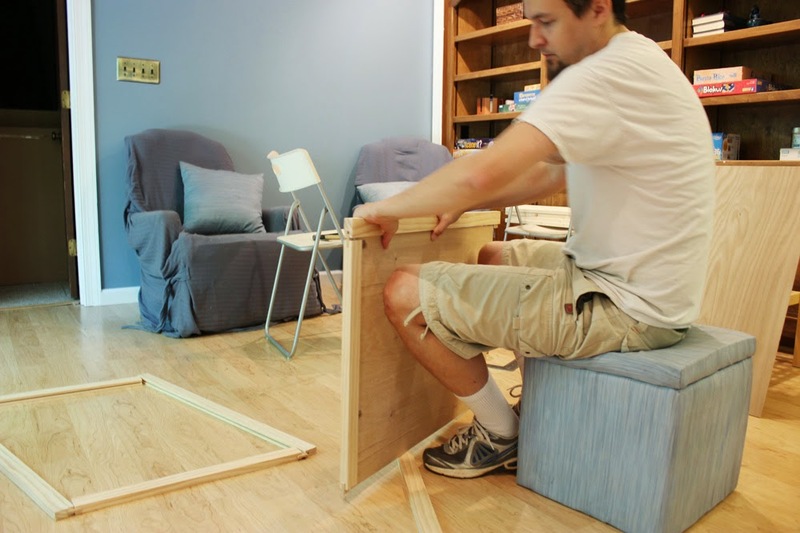 This was so we can be flexible if ever we need to get a new TV mount that doesn't fit perfectly in this paneling--we can just pull down the one sheet and redo it, rather than having to pull down the entire top section. 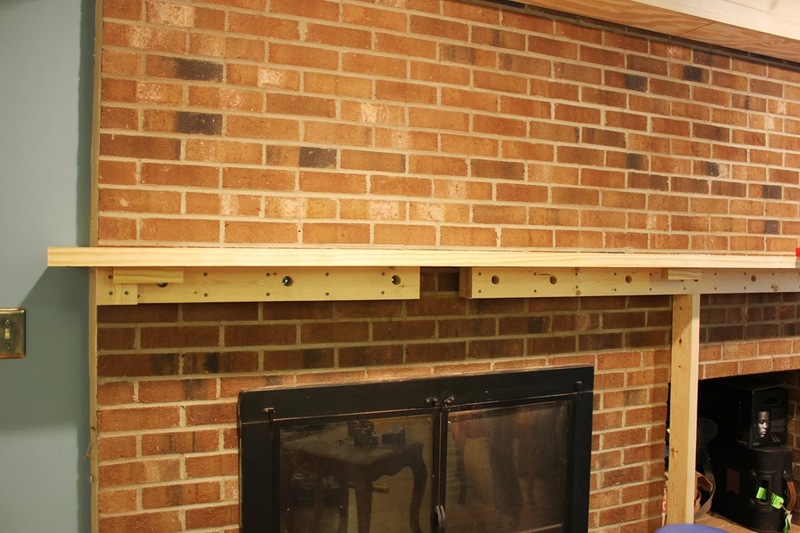 The beginning of the shelves. We just installed these with pocket screws, into the hidden blocks behind the bulkhead. 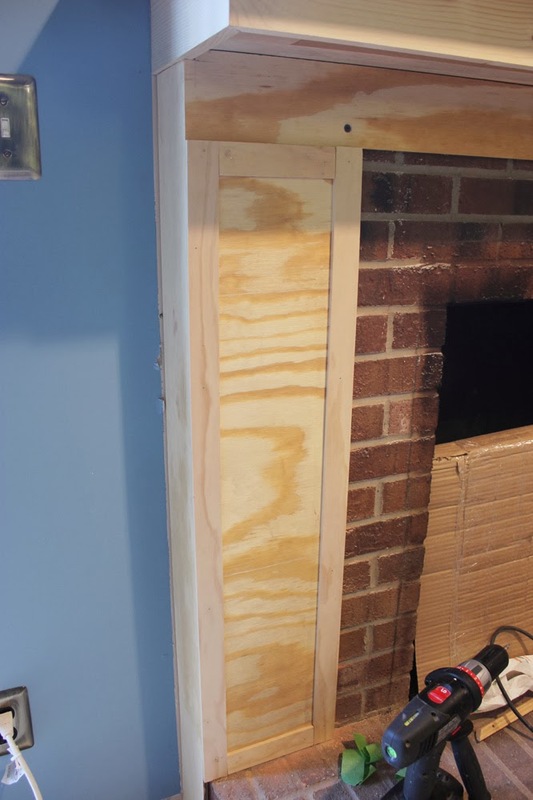 The far right shelf support was done out of two layers of plywood, so the outer layer could go all the way to the wall, covering the side of the brick. 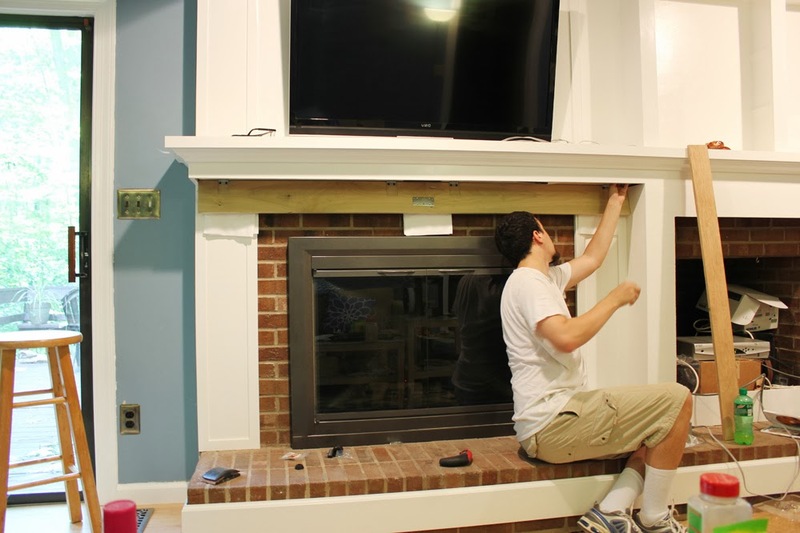 As far as installing the TV mount, we wanted it to be as flat against the surface of the brick as possible. 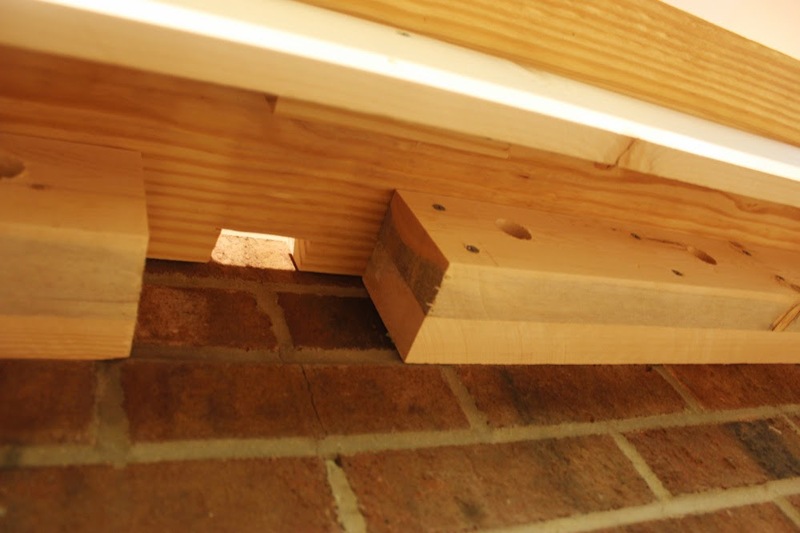 Not only for aesthetics, so it didn't stick out further than needed, but also because it was going to be a more secure install directly on the brick, rather than the bolts going through a sheet of plywood that is only attached to the brick in a few places. We started with a fit test on the brick. 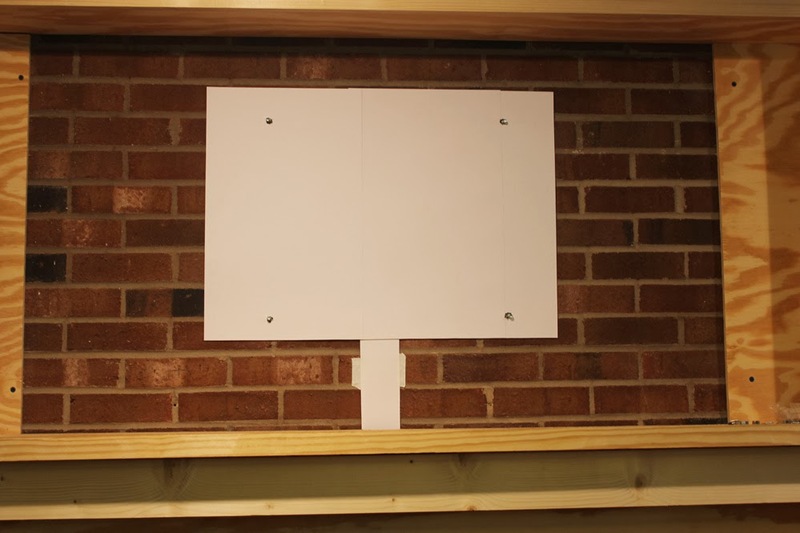 And then I realized that we would still see brick when the TV was pulled away from the wall, so I made a card stock backing for the mount. 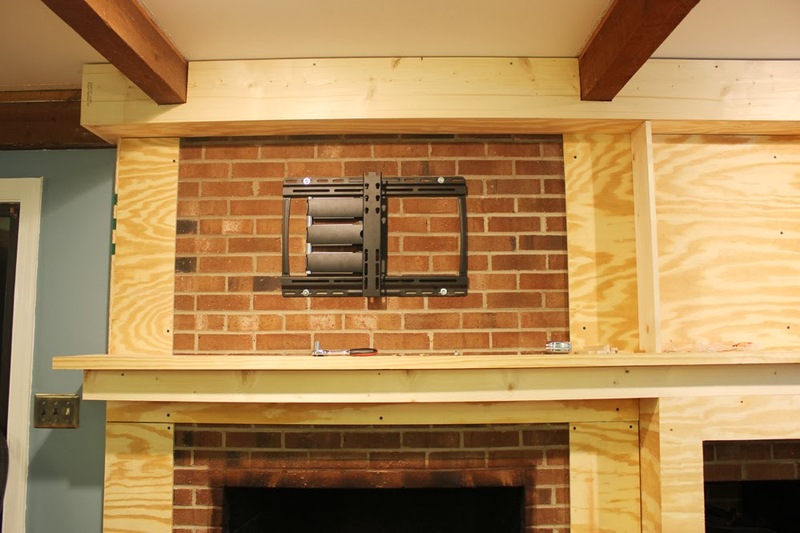 And here is the mount attached to the brick, with the plywood panel installed around it. More pieces of the shelves going up. Next we were ready to start putting up the trim. 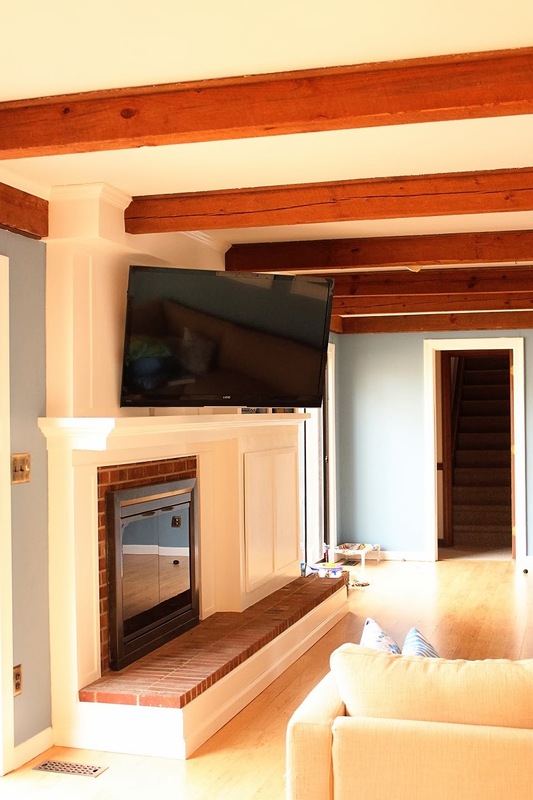 My husband put up the crown moulding while I spent a whole morning just cutting and installing the shaker style trim on the left half of the fireplace. And we mitered the edges when trimming out the front of the mantel top. 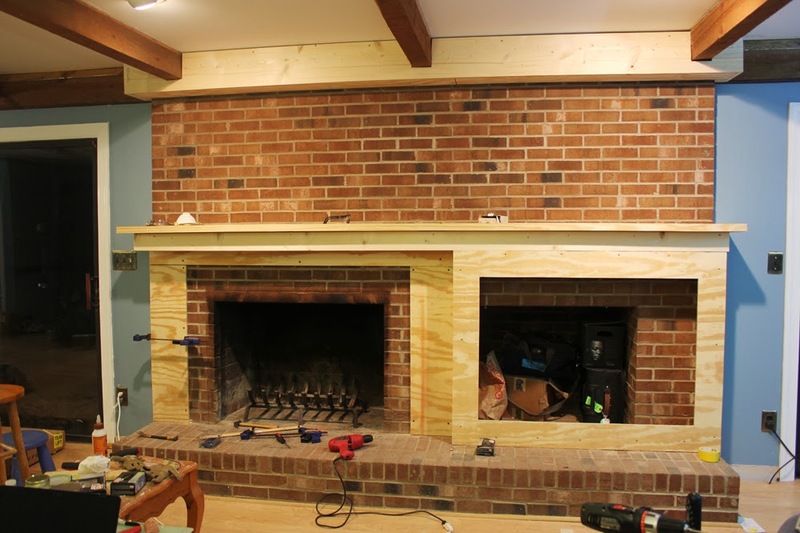 Around this time we also got started on the hearth wrap. This was something that I really felt was necessary, to ground the whole facade and tie it all together, so it doesn't just look like the wood facade is floating over the hearth. 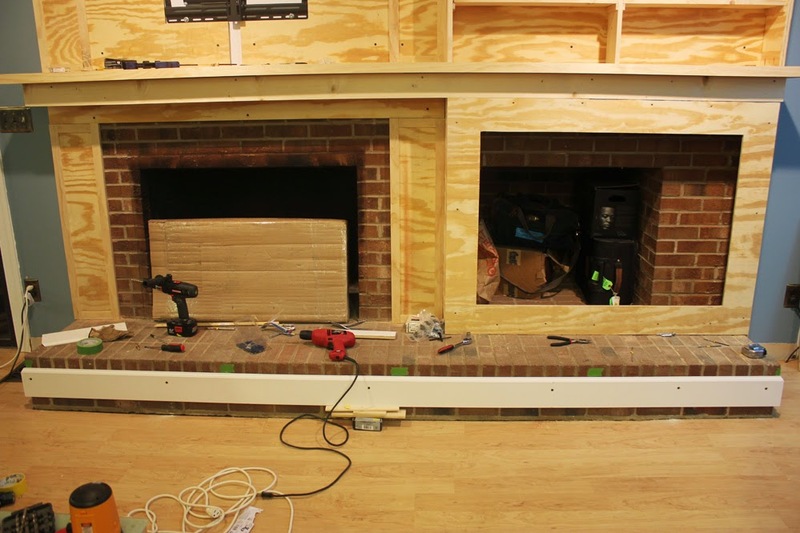 The top part of the hearth wrap was 5 1/2 inch baseboard moulding, that we mitered at the edges for a clean fit. We specifically left a space along the bottom, so we could run cables or speaker wire in the future if we want to. And then we covered the space with baseboard to match what we have in the rest of the room. The baseboard isn't actually attached, so it can easily be pulled out for running wires behind it. 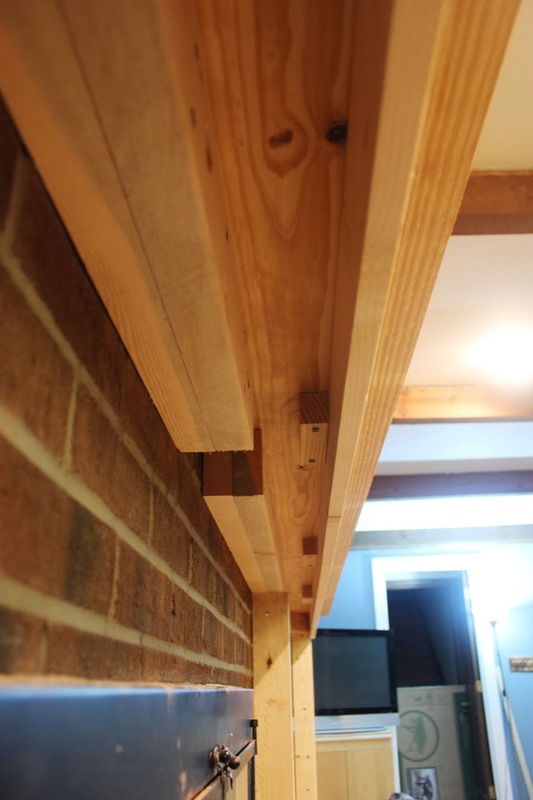 Instead, we have a few little blocks of wood that hold it in place on the front side with tension against the 5 1/2 inch baseboard, and at the wall on either side, the baseboard slips in next to the baseboard attached to the wall, which holds it in place. We also managed to get the new glass doors and the TV up that night. 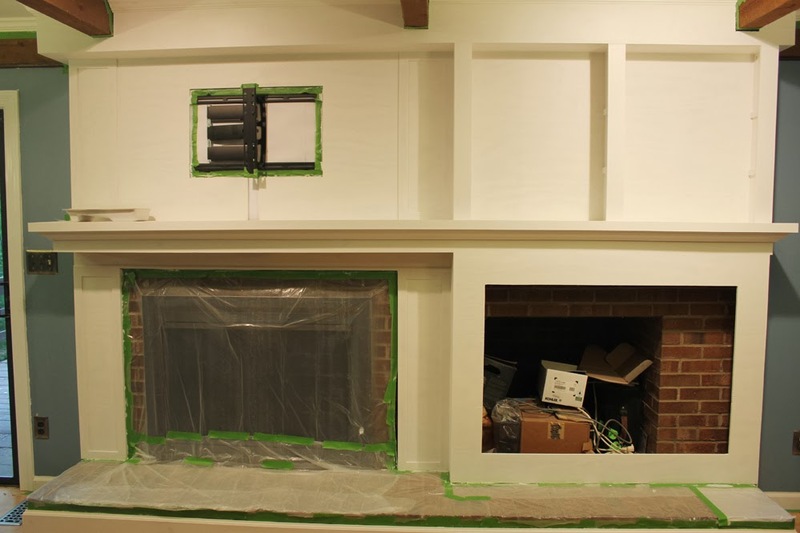 And here is a shot with the remainder of the trim in place, the front trim on the shelves and crown moulding under the mantel. 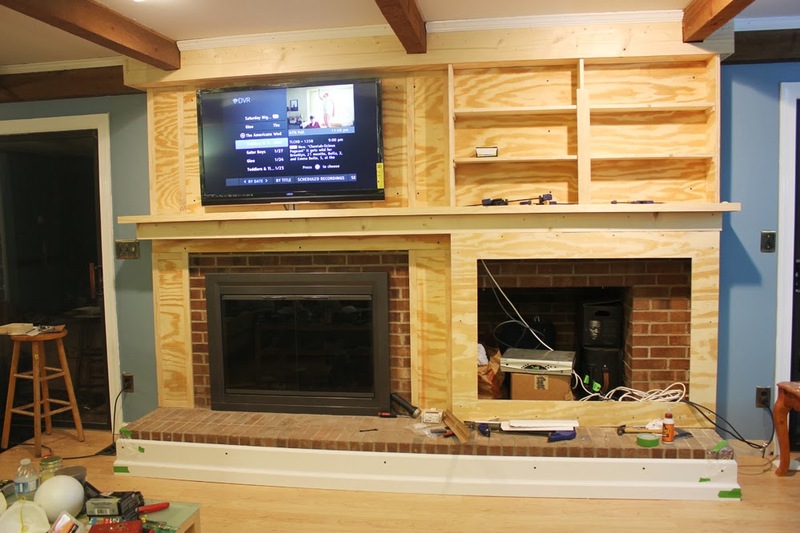 This is where we left the project for a good 3 months, until we finally got sick of looking at plywood enough to haul the TV down and get to painting. Lots and lots (and lots!) of painting. Two coats of Kilz primer and two coats of paint (we used Ben Moore Advanced in Chantilly Lace). 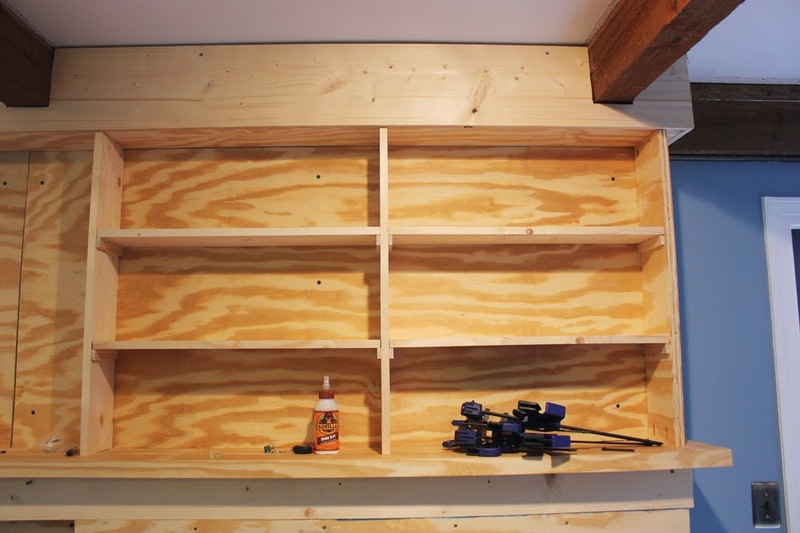 A tip for painting shelves, use nails in the ends to suspend the shelves in the air, so you don't have to wait until the top coat dries before you can flip them to paint the bottom. 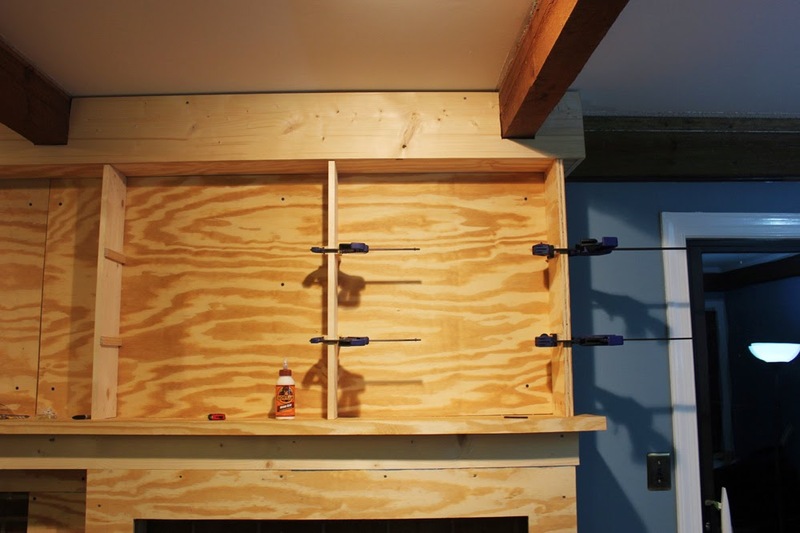 While I was painting shelves, my husband was working on the bottom cover for the mantel. Here is what it was looking like with the cables run inside of it and down into the cabinet. The panel in it's open position. And here it is closed (ignore the paper towels, they were just there so the hinges wouldn't scratch the paint when they were being installed). From the outside you can't see the hidden hinges, and to open it you just push up from the bottom a half inch to disengage the push cabinet magnets, and swing the panel down. And once that was installed, we were able to caulk everything. 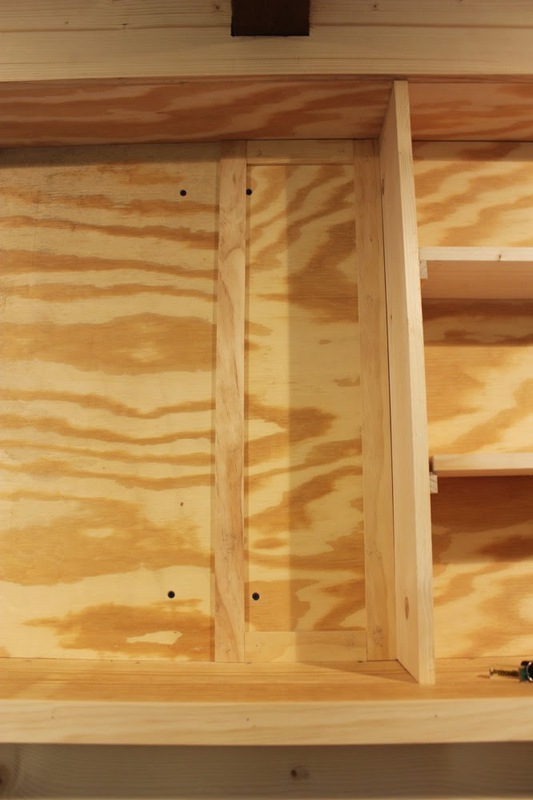 Then, the very final piece to the project was the cabinet doors with the shaker detailing, which my husband built by cutting channels in 1x2s with the table saw. 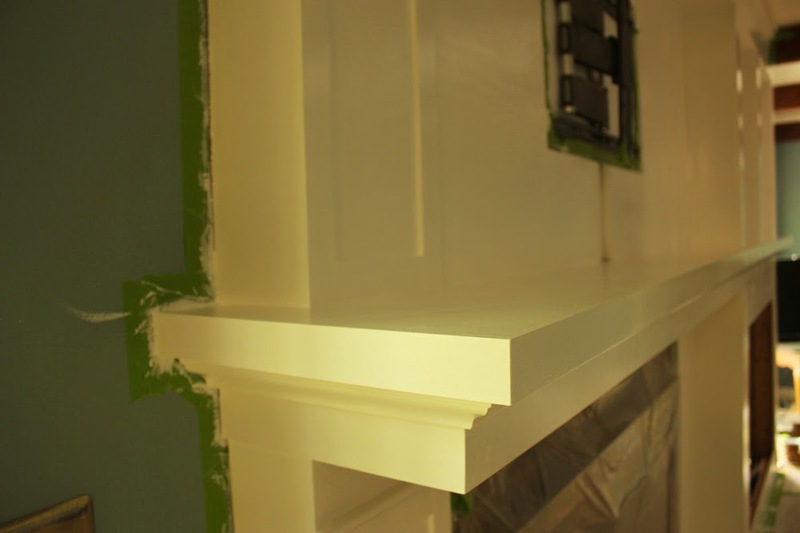 Then he just ran glue down the channels and snapped them over wood panels to form the trimmed out cabinet doors. And once the doors were painted and installed, we were done! So now I can finally share the "after" photos. 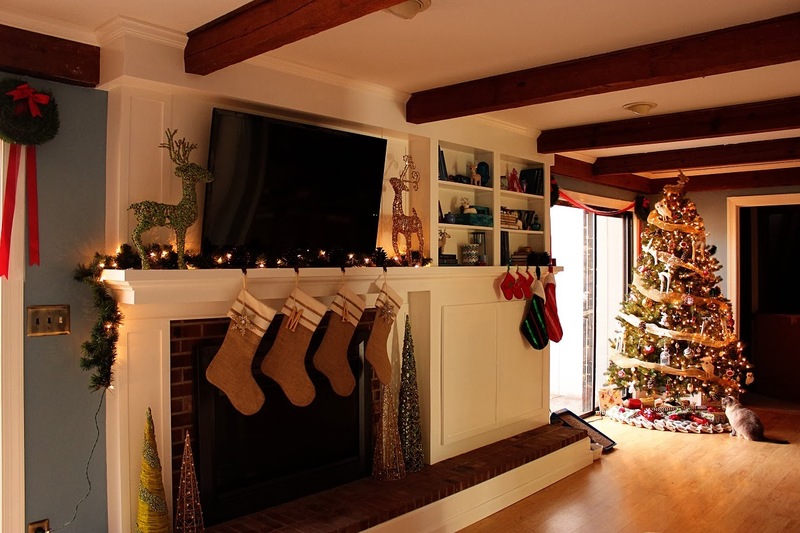 And here it was at Christmas, all decked out with stockings and lights. 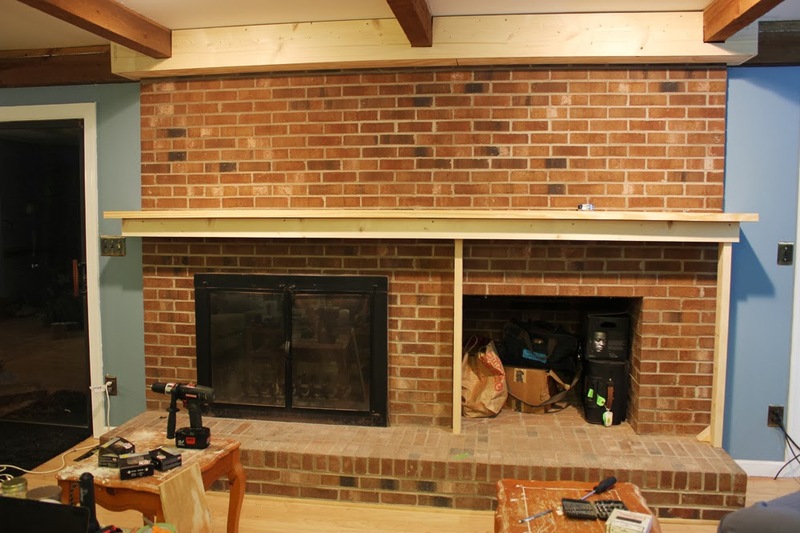 With our TV mount we can pull it out 18 inches off the face of the fireplace, although that isn't really necessary. But it is nice to be able to angle it to face the kitchen while cooking! 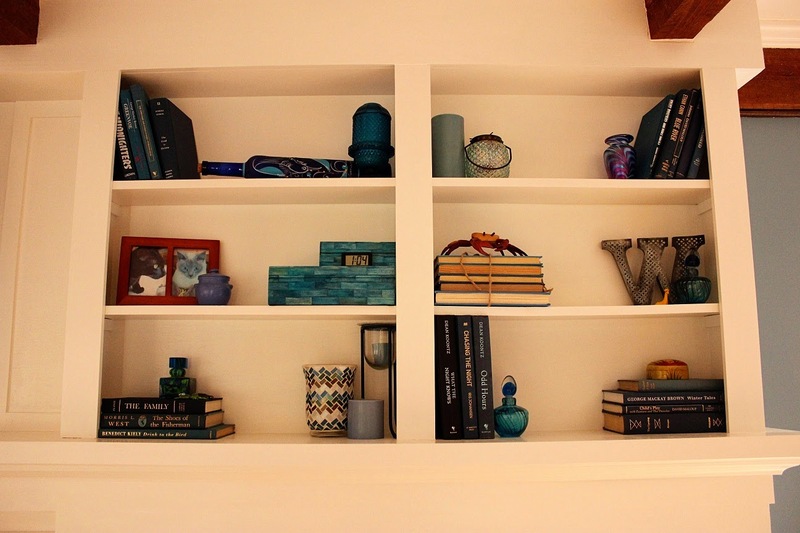 The shelves, decorated with thrift store books, vacation souvenirs and random odds and ends that will probably change over time. 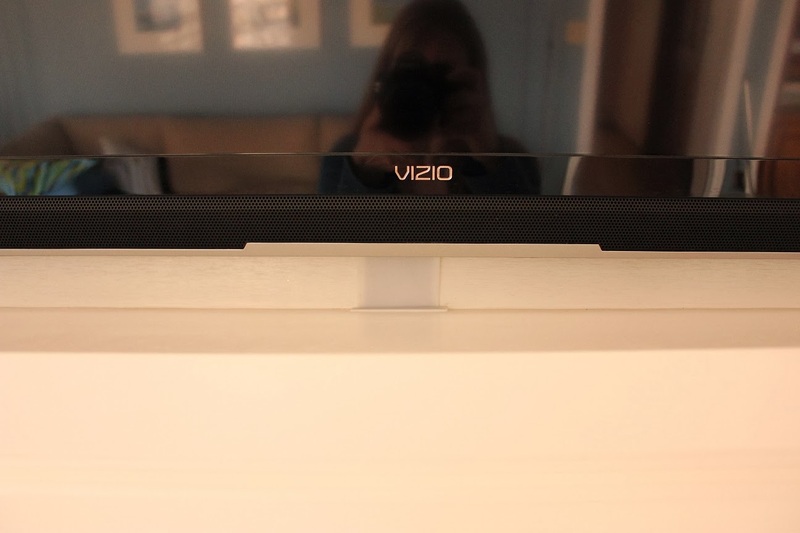 And here under the TV you can see where the slot for our TV cables is covered with a little plastic panel that snaps into place. My husband made this with his 3D printer. 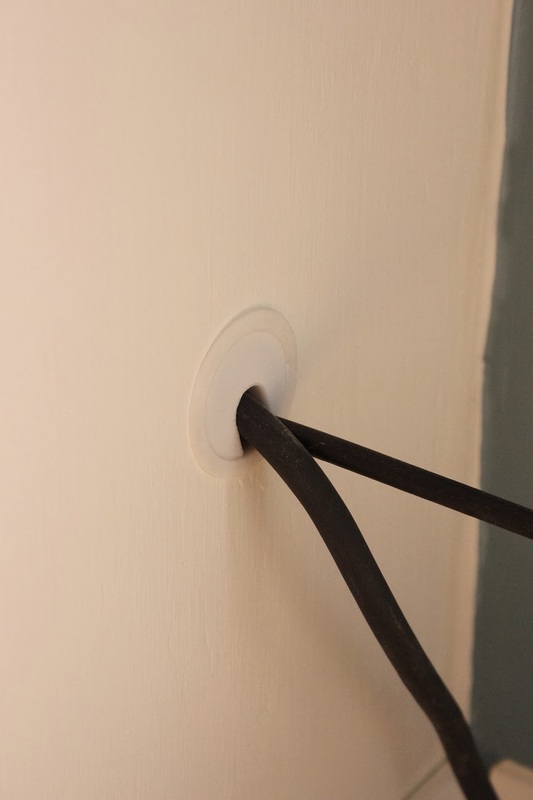 He also made a plug for the hole on the side where our power cables come out of the cabinet. And the final comparison to what it used to look like. Whew! 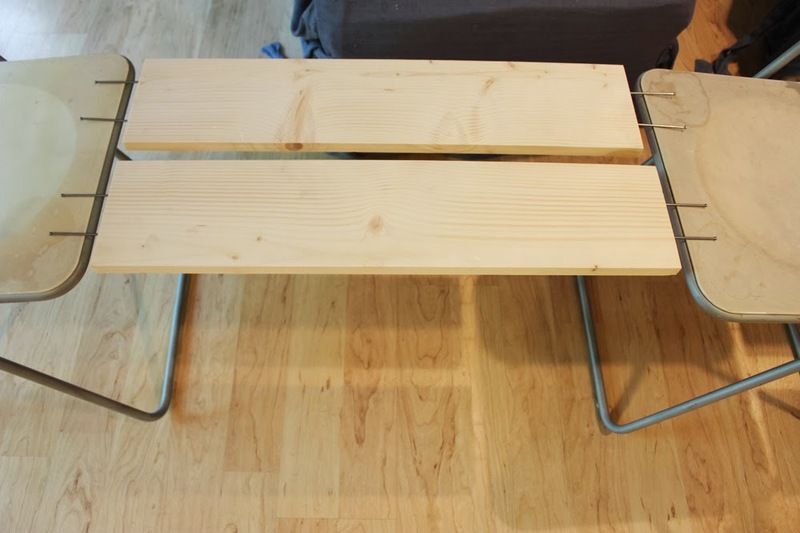 That was a long post, but hopefully all of the photos will be useful to someone building their own fireplace facade, if they ever stumble across this blog. I'm so glad we are done with this project though! It was hard and took a long time to complete, but I'd do it again in a heartbeat. 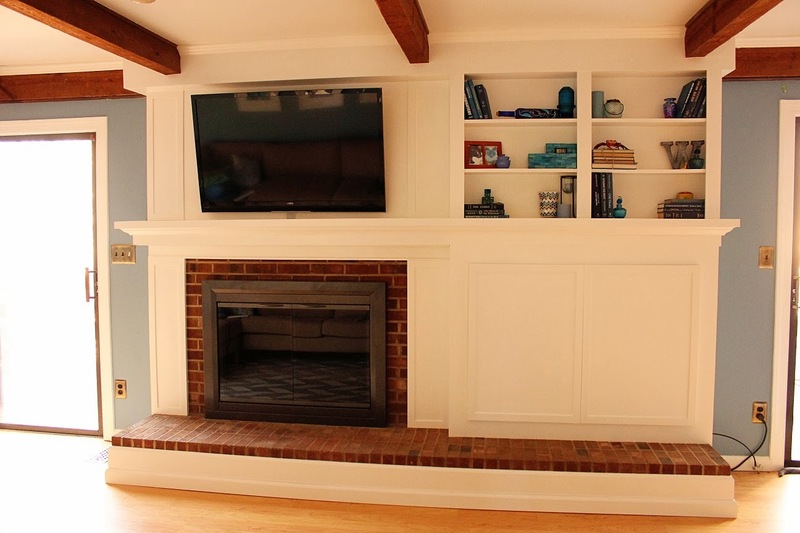 I definitely think it was a huge step toward updating our family room, and I'm so glad we were able to come up with a way to do it without having to paint the brick. Wow, the difference is just incredible! And wayyyy more functional too. It looks so good! That's Amazing!! 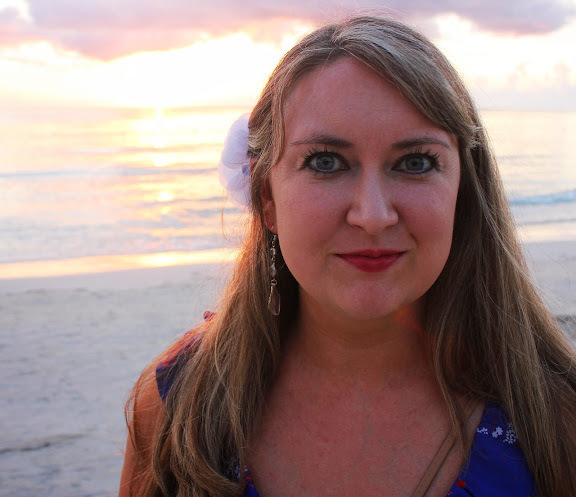 I remember you from wedding bee and just found your personal blog thanks to Heather!! I am the blog assistant for East Coast Creative and they have a big design contest coming up, announcing it this weekend, you should def check it out and enter a submission!! Thanks Allie! We are so happy with it! You are so sweet Heather! Thanks for the tip, Dianna! I will check it out. This looks so good! I love the white of the unit against the exposed beams in the ceiling. Thanks Lisa! 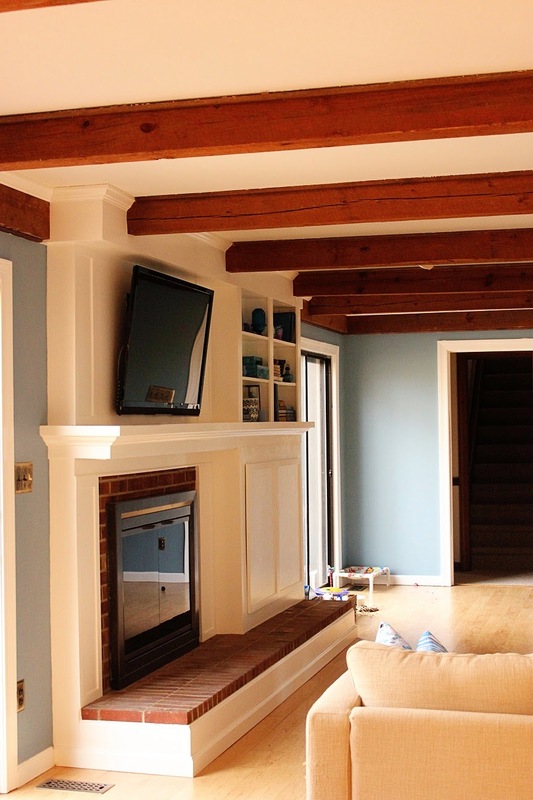 I'm so glad we decided against painting the beams white because I love the contrast. And wow, a 1955 house with only one previous owner? I bet you have a mile long list of updates in mind. It's so exciting and fun to put your own stamp on your home though! 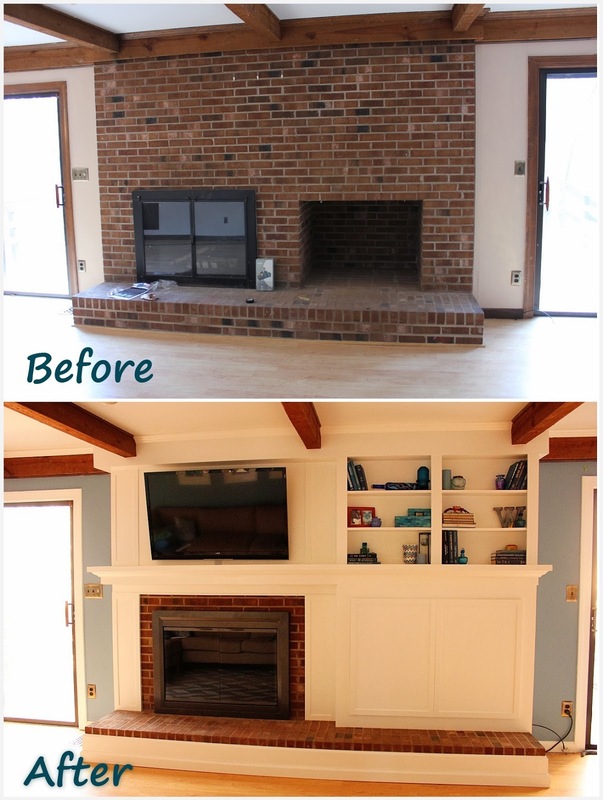 I think the entire project looks amazing and I can't believe how much you were able to transform the fireplace. It's definitely been a fun experience reading along! This looks AMAZING!! You two are so freakin handy it's incredible. I've been waiting for this post to go up and it was worth the wait. Great job! How much did something like this cost? We are looking at a house built in 1960 and it has a fireplace that is very similar! I would love to do something like this. Hi Breanna, we probably spent around $250 for all of the wood, trim, screws and anchors. And the fireplace glass doors were around $250 as well (purchased on Amazon). With the paint we spent about $550 on the whole project. Wow that makes such a difference for not much money! That looks so gorgeous! Thanks for this tutorial. I definitely want to do something similar in our house!